Once you’ve determined your organization needs a new tool or technology, how do you build the business and investment cases to show leadership the clear path towards the changes that need to occur? Dani Johnson, VP of Research at Bersin by Deloitte, Deloitte Consulting, recently spoke with 3 learning leaders from Disney, AT&T, and Airbnb to learn more about their individual journeys with technology. Those on the journey to finding or implementing new tools and platforms likely have one thing in common: the current solution isn’t working. “We had a traditional learning management system that was written for one context and one moment in time, so it was very, very clear that it wasn’t working. We addressed it, which tied to a strategy that reevaluated some of our larger HR investments, including learning,” revealed Chris Trout, VP of L&D at the Walt Disney Company. While larger organizations might have the bandwidth and budget to be flexible and try multiple solutions, sometimes it’s best to start fresh. Such is the strategy behind the learning success at Airbnb: ”We took a bold move to ‘divest’ rather than invest first, to turn off a lot of the learning infrastructure that was already there in order to almost start from a baseline,” explained Barry Murphy, head of Global Learning at Airbnb. Of course, it’s not that easy for every organization. 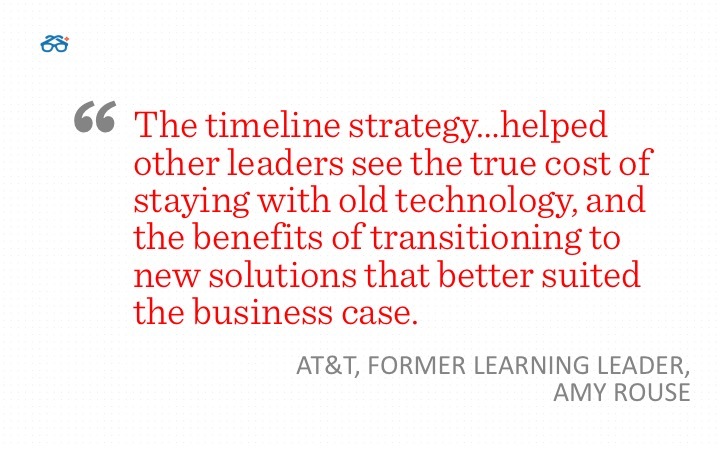 For a monolithic-type project of large scale, Amy Rouse, former learning leader at AT&T, knew she had to find a way to streamline numerous disparate platforms and get rid of old technology to make room for what they needed. The one thing all 3 organizations had in common? Starting with a vision. “We looked in a few places, including how technology was happening at the time, how HR and learning technology was happening and knew we wanted to pursue a technology that was going to help us get to that vision,” said Trout. Airbnb started working against their vision of a learning ecosystem, in search of the technology that could do what they wanted. “Being able to explain the vision to stakeholders is probably one of the most important things associated with making that business case,” added Johnson. Start with a vision and keep the “end” in mind. Many organizations get caught up in having the latest and greatest technology. Instead, choose what will help you achieve your long-term vision. Create a timeline. This can include when you’ll turn off old technologies when you can scale up the new technology, or important events in the business that will require the use of the new technology. Divest before you invest. Know what isn’t working, get rid of the tools and platforms that are not producing ROI, and then re-allocate those resources to things that do. What are some ways you have made the case for implementing a new technology at your organization? Let us know in the comments. Want to know what else the presenters talked about? Access the full webinar through Degreed here.